The conditions haven’t been this ripe for populism for decades. From coast to coast, left to right, an authentic grassroots resentment of our current economic instability is roiling the country. But whether it’s the Tea Party on the right or the Occupy Wall Street protests on the left, we have yet to see the most predictable symptom of such movements—a recognizable populist leader. Last year, the Tea Party auditioned both Glenn Beck and Sarah Palin for this role, but they both sputtered. Meanwhile, Occupy Wall Street is dogmatically horizontal, even cellular, with membership actively (and anarchically, in the truest sense) fighting any sort of hierarchy. But, however much he casts himself as a classical populist, there is something new in Cain’s style. He is outrageous, not angry; opportunistic, not dogmatic. His agitation is a form of entertainment, rather than the other way around. It’s a new kind of populism that Cain is offering, one tailored for an era where sound bites, Fox News, and the imagined specter of Barack Obama have conspired to create a uniquely warped echo chamber on the right. LOOKING AT POPULISTS from America’s past will help put Cain’s political style into sharper relief. Take three eras in particular: the 1930s, the 1950s, and the early 1990s, where populists all took advantage of widespread fear or outrage to rise politically. In the first period, following the stock market crash of 1929, the social and economic upheaval of the decade that followed gave birth to populists from Louisiana governor Huey Long, to the insanely popular Detroit “radio priest” Father Coughlin, to an early advocate for the elderly poor, Doctor Frances Everett Townsend. All of these figures were enabled by popular rage, and they all promised to end the Depression. But the moment was short-lived: With the exception of Huey Long, whose political arc was cut short by assassination, each of these figures failed to translate their populist support into electoral reality. The next period of unrest came in the 1950s, when the Soviet Communist threat stoked fears among ordinary Americans, whose paranoia about an internal Communist threat served as tinder ready for a match. Senator Joseph McCarthy exploited the opportunity, brazenly enjoying a three-year parabola of fame. But he collapsed as quickly as he rose, with the Senate belatedly recognizing the violent absurdity of his appeal and censuring him. McCarthy died less than three years later, in ignominious alcoholism. The most recent (and least likely) period of populism came in the 1990s, when agita about the deficit, the two-party system, and multiculturalism gave rise to Ross Perot and Pat Buchanan. Perot launched a wild, self-funded challenge to the major parties, capitalizing on his outsider persona and penchant to say virtually anything. Fueled by independent and conservative white men, Pat Buchanan—who called for pitchforks—offered a similar challenge, but in a more demagogic style. Yet both men collapsed—Perot the victim of his own weird conspiracy theories, Buchanan’s nativism and jingoism ultimately pulling him too far to the right of the general public. Where Cain differs from past populists, however, is in the broader sweep. His whole platform is gestural rather than systematic, unbothered by inconsistency. Whereas traditional populists at least propose a nexus between their policies and the problems of the world, Cain’s politics seem fundamentally dishonest. Indeed, his main claim is not that things will work better under his administration—he cannot even be bothered to explain how his 9-9-9 tax plan would work—but that they will be simpler. It’s no accident that he attacked Romney in a recent debate on the sole basis that his economic plan has 59 points. At a time when vagueness and confusion are political norms, Cain knows that the appearance of clarity and authenticity are a balm. It’s no surprise that Cain summarizes his foreign policy as “peace through strength and clarity”—an utter cliché that somehow in our current climate manages to gain authority with each repetition. A comparison with Huey Long is instructive. Everything about Long was outrageous—his clothes, his style of speaking, his policies. Long spent the first half of the 1930s assailing FDR and his team for ignoring America’s rural masses, while proposing radically redistributive policies such as income caps on the wealthiest Americans. But however extreme Long’s ideas, they at least were authentic efforts to improve the material lives of his followers. Meanwhile, much of what Cain offers is similarly outrageous—from his tax plan to his YouTube ads—but it’s offered with a wink (or in the instance of his now-famous cigarette ad, a Cheshire-cat grin), one that undoubtedly registers among his supporters. In other words, no substantive ambition actually undergirds Cain’s protests. He is an ironic populist, one who not only acknowledges the centrality of entertainment to his politics, but embraces it. In all of these ways, Cain is a symptom rather than a cause of our new politics. 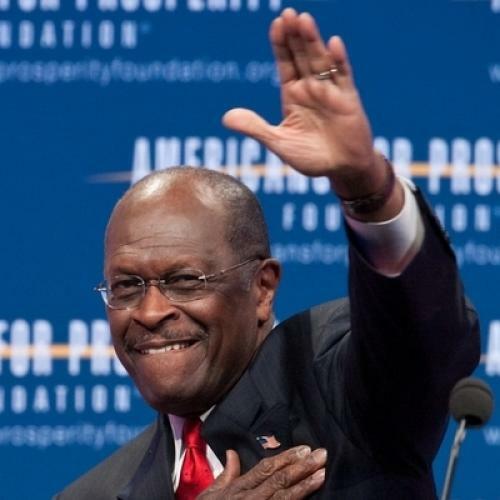 The conditions were ripe for this sort of perverse populism, and they are venting through a vessel called Herman Cain. After decades of offering dogma on the issues of God, guns, and gays, conservatives have ceded any ground from which offer coherent critiques of the country’s problems, much less solutions. Cain is canny enough to recognize that contemporary conservatism, at its most potent, begins and ends in free-wheeling rhetoric, rather than actual governmental policy. Tellingly, a woman who runs a successful marketing firm in Washington recently told me that she was impressed with Cain’s campaign. “You can tell he’s in business,” she said. “You can tell he understands marketing.” And it’s not only the public that he’s marketing toward. With Fox News constantly on the lookout for popular political “commentators,” Cain needn’t fear flaming out as quickly as his populist predecessors. Indeed, it’s exceedingly unlikely that Cain can, or even wants to, ride his populist mantle to the height of political power. Like the right-wing talk radio hosts whose ranks he used to count himself among, he is drawing strength from a small, inflamed minority—about a quarter of likely Republican voters. And as the 1930s, 1950s, and 1990s show us, when populists enter national politics in America, they usually discover an irreconcilable conflict between their raucous appeals and the American system’s fundamental bias toward candidates who can speak to a sound-minded majority of the country. That’s why, in the final analysis, Cain’s sui generis brand of populism will almost certainly fail to migrate to the general population. The radical right-wing culture he appeals to, despite its very noisy protestations, has by definition arrayed itself against mainstream America. Cain claims he’s a force of the people, and in a way he’s right. His rhetorical, evanescent, only-in-our-times burst of fame will likely prove his greatest obstacle to actual political success. But a future in entertainment? There, the sky’s the limit. Michael Signer is the author of Demagogue, an adjunct professor at Virginia Tech, and Managing Principal of Madison Law & Strategy Group, PLLC in Arlington.